Fort Constitution is an old structure with a history searching deep into New Hampshire's colonial past. It is located on New Castle Island in Portsmouth Harbor. After the outbreak of the Civil War it was garrisoned by New Hampshire Militia. One of these units was an independent company commanded by James Davidson. They were mustered into United States service on May 15, 1862. Thomas Hale was a 55-year old shoemaker born in Newbury, Massachusetts, but residing in Laconia, New Hampshire. Often preexisting civilian bands were induced to enlist providing a group of men used to playing together and instantly good military music. These bandsmen were often older than the usual recruits. Garrison life must have been easy service for a 55-year old. However, on August 6, 1862 the company was added to the 9th Vermont Infantry Regiment and they were sent into the field. They were present at the battles of South Mountain September 14, 1862 and at Antietam on September 16-17, 1862 as part of the General Burnside's 9th Army Corps of the Army of the Potomac. 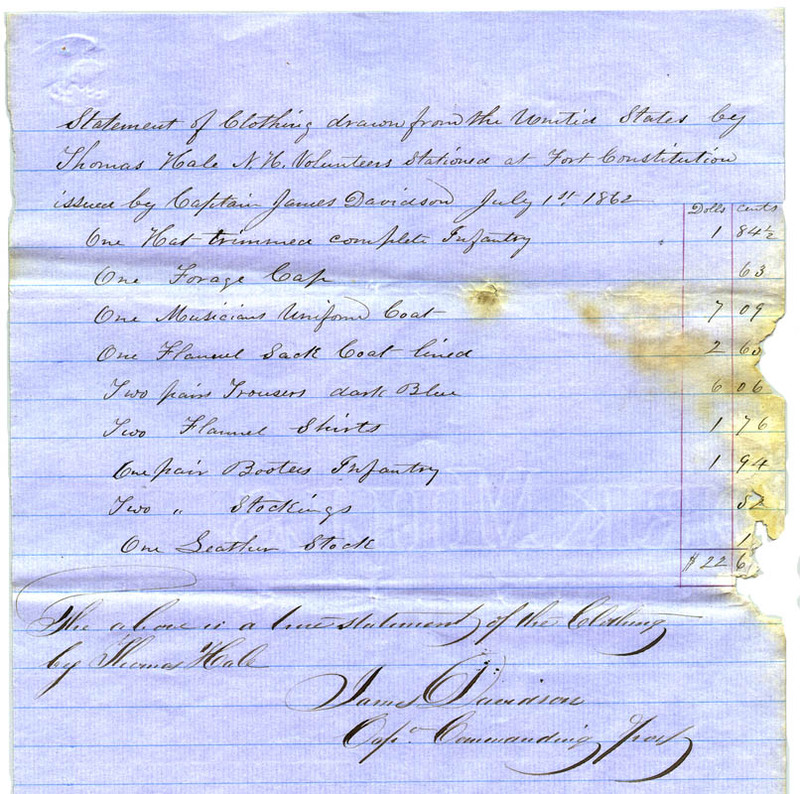 Hale must not have held up too well as he was discharged on October 22, 1862. The clothing issued to Hale is what you might expect a new musician would need. The items are all things issued by the Quartermaster Corps. His other equipage would be charged to the Ordnance Department and might include any leather gear or weapons. A musician might be issued a musician's sword, for example. Hale received both a forage cap and Jeff Davis hat with trim and a musician's frock (uniform) coat and sack coat. Recruits were to be issued an unlined frock coat but Hale received a lined one. It is also interesting that he was issued dark blue trousers instead of light blue ones generally worn by infantry soldiers. 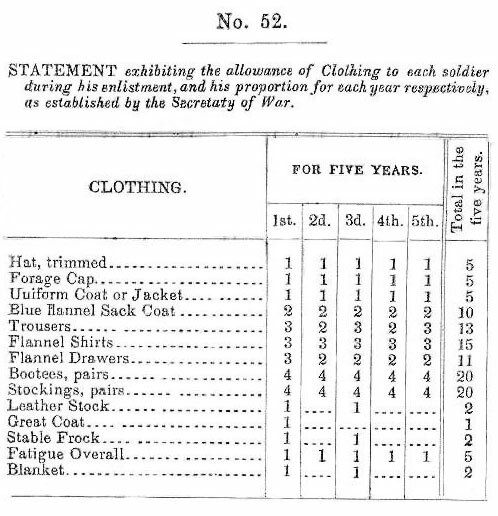 General Orders 108 of December 16, 1861 changed the color of trousers from dark blue to light blue, which was less expensive to produce. It is possible that the band was issued remaining dark blue trousers as a distinction or that they were using up existing stock. The last item he received "One Leather Stock" deserves comment. These were worn by soldiers around the neck to encourage them to hold the head high. The stock was the origin of the Marine Corps nickname "leather neck." By the time of the Civil War their use had almost died out, but here we have an example of one being issued.